We are interrogating the druggability of protein surfaces within the context of heteromeric multi-component protein complexes. How are these macromolecular interactions best exploited for developing novel chemical probes of protein function? To address these questions, we are studying as model systems members of the human Cullin Ring E3 Ubiquitin Ligases (CRLs), a family of multi-subunit enzymes that target substrate proteins to the proteasome for degradation (reviewed by Bulatov & Ciulli, Biochem. J., 2015). This family of proteins are strongly linked to cancer and other diseases, because of frequent cancer-associated mutations in their coding genes and their roles and roles of their regulated substrates as either tumor suppressor or oncegenes. However, their structural and functional complexity make them difficult to characterize and "drug" using conventional target-based approaches. These complex molecular machines rely on several protein subunits assembling and working in concert rather than on single proteins working alone. They do not comprise a traditional active site for binding of a small molecule cofactor or substrate. In contrast, their ubiquitin-transfer activity is accomplished by bringing the substrate protein (S) and ubiquitin (Ub) close in space via two separate arms, a substrate binding domain (SBD) and an E2-Ub binding subunit, assembled around a central cullin scaffold subunit. We are currently focusing on a subfamily of human cullin2/5 CRLs that recruit ElonginB/C as adaptor proteins, including the von Hippel-Lindau protein (VHL), members of the suppressors of cytokine signalling (e.g. SOCS2, see Bulatov et al. J. Biol. Chem. 2015) and members of the ankyrin repeat and SOCS-box domain proteins (ASB9, see Thomas et al. Biochemistry 2013). Many of these are of particular scientific interest as novel drug targets due to their overexpression in cancer tumours and other diseases. We investigate the structure, assembly and native interactions of CLRs, identify and develop small molecules that target CRLs and evaluate their biological function as chemical probes of CRLs. Through fragment and peptide screening approaches we seek to discover novel potential binding sites, both common to the whole CRL subfamily (for example on Elongin B or ElonginC), and specific for individual substrate recognition domains (e.g. VHL, SOCS2, ASB9). In collaboration with scientists at Yale University, we discovered the first-in-class small molecules that target pVHL and disrupt its interaction with its natural substrate Hypoxia Inducible Factor 1 alpha subunit (HIF1α) using structure- and fragment-based design (Buckley et al., J. Am. Chem. Soc. 2012; Van Molle et al., Chem. Biol. 2012). The Ciulli laboratory have later combined extensive rational design, guided systematically by protein crystal structures and biophysical binding assays, to improve the affinity and physicochemical properties of the compounds (Galdeano et al., J. Med. Chem. 2014). In work recently published in Nature Communication, and in collaboration with Sonia Rocha, Doreen Cantrell and Kevin Read team at Dundee and Paola Grandi and co-workers at Cellzome-GSK, our laboratory disclosed small-molecule VHL inhibitor VH298 as a novel chemical probe of the hypoxia signaling pathway (Frost et al., Nat. Comm. 2016). We show that VH298 engages with high affinity and specificity with VHL as its only major cellular target, leading to selective on-target accumulation of hydroxylated HIF-α in a concentration- and time-dependent fashion in different cell lines, with subsequent upregulation of HIF-target genes at both mRNA and protein levels. VH298 represents a high-quality and selective probe of the HIF signalling cascade, which improves over conventional chemical tools such as iron chelators and PHD inhibitors that have broad-spectrum activities and off-target effects. VH298 provides also an attractive starting point to the development of potential new therapeutics targeting hypoxia signalling. 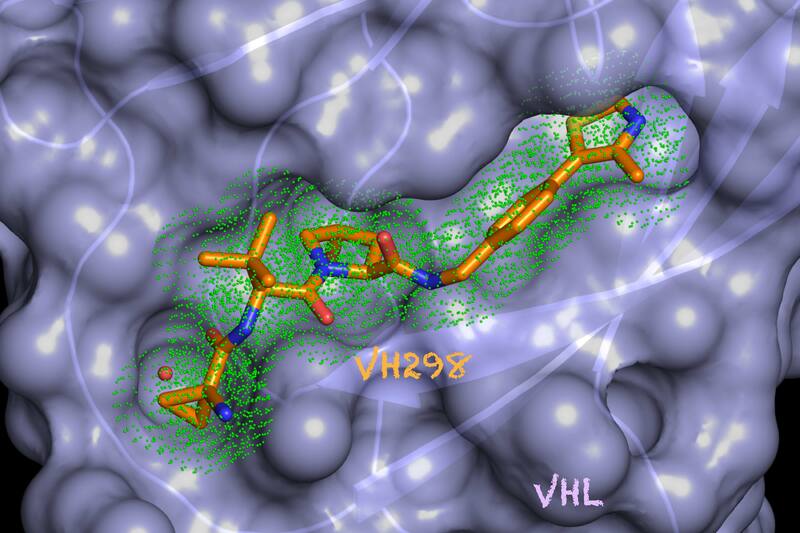 A visual representation of the crystal structure of the VH298 molecule bound to its target VHL. We are now taking CRL chemical probes one step further by using these as chemical scaffolds within novel drug-like Proteolysis Targeting Chimeric molecules (PROTACs) to recruit CRLs in close proximity to a protein of interest and as a result triggering the targeted protein to proteasomal degradation. Our discoveries have contributed to the realisation of the PROTAC approach for drug discovery, and have contributed to the establishment of a Discovery Platform Unit (DPU) in Protein Degradation within GSK Stevenage, spin-off company Arvinas in the U.S. We are now collaborating with Boehringer Ingelheim on further developing this exciting new disrupting modality of cheimcal intervention. Potent and selective chemical probe of hypoxic signalling downstream of HIF-α hydroxylation via VHL inhibition. PLoS ONE June 29, 2015; 10(6):e013218. Targeting Cullin-RING E3 ubiquitin ligases for drug discovery: structure, assembly and small-molecule modulation. Biochem. J. 2015, 467(3), 365-386. Biophysical studies on interactions and assembly of full-size E3 ubiquitin ligase: suppressor of cytokine signaling 2 (SOCS2)-elongin BC-cullin 5-ring box protein 2 (RBX2). J. Biol. Chem. 2015, 290(7), 4178-4191. Structure-guided design and optimization of small molecules targeting the protein-protein interaction between the von Hippel-Lindau (VHL) E3 ubiquitin ligase and the hypoxia inducible factor (HIF) alpha subunit with in vitro nanomolar affinities. J. Med. Chem. 2014, 57(20), 8657-8663. 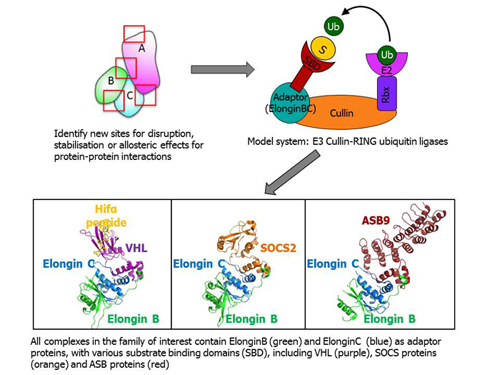 Multimeric Complexes among Ankyrin-Repeat and SOCS-box Protein 9 (ASB9), ElonginBC, and Cullin 5: Insights into the Structure and Assembly of ECS-type Cullin-RING E3 Ubiquitin Ligases. Targeting the von Hippel-Lindau E3 Ubiquitin Ligase Using Small Molecules to Disrupt the VHL/HIF-1α Interaction. J. Am. Chem. Soc. 2012, 134, 4465–4468.